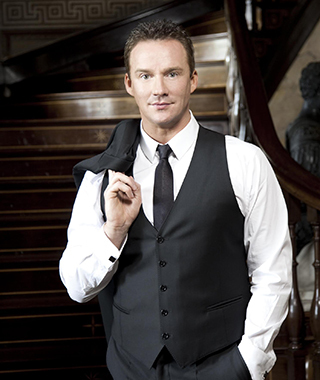 Russell Watson never imagined he would someday be hailed as one of the world’s greatest classical singers. Once described by the New York Times as a performer “who sings like Pavarotti and entertains the audience like Sinatra,” he has released ten studio albums, each one receiving more critical acclaim than the last. His debut album, The Voice, shot up the UK charts and held the number one spot for a world-record 52 weeks. Russell held the number one spot in the United States, giving him the accolade of a simultaneous transatlantic number one. His amazing road to success was not a stereotypical one. Russell left school at the age of 16 with no qualifications and spent the first eight years of his working life in a factory making nuts and bolts. Wanting to escape the monotony he entered a local radio talent competition where he beat 400 other contestants. This was the precursor to a career that has spanned 15 years and seen him perform for some of the world’s greatest figures, including the Queen, the Duke of Edinburgh (Watson is an ambassador for the Dukes Fellowship Charity), Prince Charles (he is an ambassador of the Prince’s Trust), the late Pope John Paul II at the Vatican, former U.S. Presidents Bill Clinton and George W. Bush, and various European prime ministers, to name but a few. He has sung at many prestigious events, and to quote respected sporting journalist Paul Hince, present at one performance where Russell sang Nessun Dorma: “You know when you have witnessed something special when even the cynical hacks in the press box rise to their feet and join the ovation. I swear, even the pigeons on the roof of the stands flapped their wings.” This triggered a series of sports-related performances. He was invited to perform so often that one journalist was quoted as saying, “There is only one person to have appeared more times at Wembley this year than David Beckham, and that is Russell Watson!” Among other appearances was a performance at the opening ceremony of the Commonwealth Games in 2002, where he sang to a worldwide audience of one billion; at Buckingham Palace for the Queen’s Coronation Gala Festival 2013; and in the opening ceremony of the World Games. Other collaborations include with Meatloaf, Lionel Richie, Paul McCartney, and the late, great Luciano Pavarotti. His performances in stage shows have also earned him great critical acclaim, but it was his recent collaboration with Alain Boublil and Claude-Michel Schonberg that allowed him to fulfill a lifetime ambition to work alongside the writers of the world’s most successful musical ever, Les Miserables, where Boublil and Schonberg crafted a body of poignancy and class to his new album. Russell is celebrating 15 years as a recording artist and 25 years in the music industry.